Tacopocalypse is one of the games that I worked on while I was at Cherry Pie Games. It was intended to be a quick low-scope release to provide a minimal amount of income for the studio. It was a blast creating such a unique and quirky game, and I learned a lot more than I thought I would. Learning never stops! Tacopocalypse is now available as an early access product on Steam. 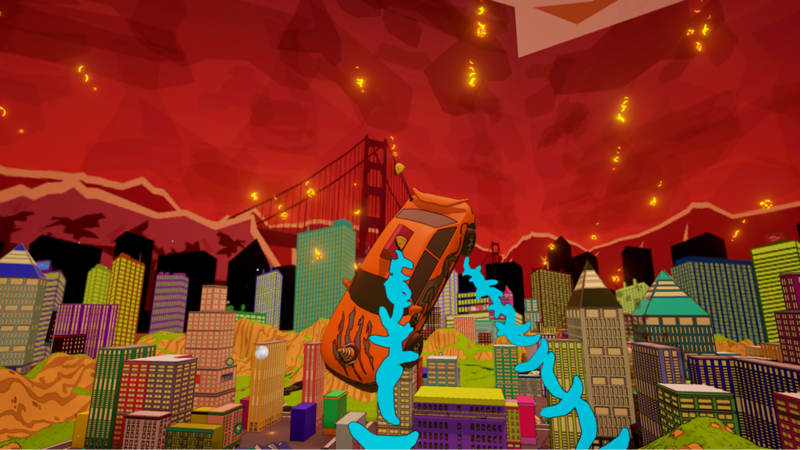 Tacopocalypse is a comedic street style stunt taco delivery game. It's set on Taco Tuesday, during the apocalypse. It is best described as a mix between Tony Hawk Pro Skater and The Simpsons's Hit and Run. While the player is delivering tacos, they must avoid obstacles and complete stunts for extra points. There are also a wide range of customization options and vehicles to choose from. The game also has local multiplayer and controller support. I was the Director and one of two programmers in a six man team. The game is half written in C++ and half in UE4 Blueprints. Every day I could find myself doing a range of tasks from writing emails to publishers, creating pitch decks, handling local community events, all the way to balancing game-play mechanics, programming, and design. Most of my time though was spent programming. If you want to know more, you can check out the Kickstarter here. (It was launched very shortly after I left). You can also take a look at the Steampage here.